Dirty Boots Flowers is an urban flower farm operated on a small parcel of land, shared with two other farms, in the East Garfield Park neighborhood of Chicago, Illinois. The land is shared with a parking lot for a powder coating factory and the parcel we use is roughly 300 feet by 40 feet. This allows for 30 beds to be used for cultivation of a variety of cut flowers. The land is managed by Casey Sabatka, with assistance from Jennifer Sher. Before receiving the grant in 2018, the farm was a small strip of land next to a fence on a different farm site and although the scale was not large, sustainable practices were used for the first growing season in 2017. Dirty Boots Flowers believes in the practice of crop rotation, for nutrient purposes and pest and disease control. We also believe in crop diversity. The farm grows over 20 varieties of flowers which helps support pollinators, increases soil health and reduces pest pressure. Although the farm is only entering it's third growing season in 2019, and the second on it's current site, all of these practices were founding ideals of the farm in 2017 and will be continued for this season and beyond. Problem: Most of the land under feet and dirt in the air in Chicago is highly contaminated with heavy metals such as lead and arsenic. Therefore, in order to grow food inside the city the first obstacle is to build a clean farm. Most farms purchase expensive and depleted top soil and have it trucked hundreds of miles to their land. Two years ago, we discovered that the chickens at Chicago Patchwork Farms were able to transform wood chips and farm waste into 75 cubic yards of clean, healthy soil. This made us wonder how else we may be able to affordably remediate the toxic land in our communities. Solution: This project aims to research a solution to the contamination problem in urban soils. We will explore two possible solutions: 1. Binding the bioavailability of the lead through the use of fish bones (Apatite II). 2. Extracting the contaminants via Phytoremediation. Once the soil from the flower farming portion of the farm (Dirty Boots Flowers) has been remediated from hazardous toxins and is food safe, it will then be cycled over to the agricultural part of the farm (Chicago Patchwork Farms). For the 9th and 10th samples, we had the bioavailability tested for the beds involving the apatite II. The soil samples correlated with the test beds we planted to measure the remediation capacity for each method. Testing at the beginning of the project gave us baseline soil samples to cross reference with the final samples that will be taken at the end of the project. We have not yet received the results of our research. Once we obtain the final soil tests at the end of 2019, we will have more insight as to the successes and failures of the project. 1 Used social media and website as an outreach tool. 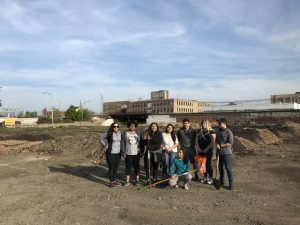 At the beginning of the 2018 season, we held a field day with a group of about eight students from Chicago Public Schools. In addition to building out the beds, we discussed the importance of practicing caution when interacting with urban soil. The students were high-school aged. Thus, we were also able to have an in depth discussion on the details of our upcoming grant cycle. This past winter (2019), we were given the opportunity to bring up the concerns surrounding food safety and urban soil at the NCR-SARE Farmers Forum at the Michigan Food and Farming Systems (MIFFS) Conference. We discussed our grant and the ways in which we are remediating the heavy metals in the contaminated soil. This presentation was a major way we reached fellow farmers and agriculture professionals in the field. Due to the nature of our work, it overlaps with issues residents of Detroit are facing with contaminated urban soil. We received a lot of interest and questions and opportunities to stay in touch. Our plans moving forward include a follow up presentation at MIFFS containing the results following the conclusion of the grant cycle in 2020. We will also share our findings with our Chicago community through various presentations such as the Midwest Urban Farmers Summit. We have also been speaking with the team at the Chicago Safe Soils Initiative, who are building a lead map of Chicago, to do some future collaborations. We will continue to post on social media and the website with updates. Thus far in the grant cycle, we have learned a number of important lessons. One of the biggest barriers we have faced is the disposal of hazardous plant material that results from phytoextraction. Upon investigating further and discussing with our network, we have found that this seems to be a hole within phytoremediation. At least, as far as accessibility to safe disposal for your average farmer/rancher or small gardener. One thing that we have learned is that many people are exploring projects similar to our own. We will be collaborating with these individuals/organizations over the course of the next year. A professor at University of Illinois has offered to test soils at the farm and is currently building a lead map of Chicago.